The organizers of the Washington Auto show have released the following statement about January 27th's activities, plans the the schedule of events. In spite of inclement weather, all media and industry events, as well as Sneak Peek preview activities, scheduled for Thursday, Jan. 27, 2011 at the Walter E. Washington Convention Center will continue as planned. The Washington Area New Automobile Dealers Association, which produces The Washington Auto Show, reminds prospective attendees to travel safely to and from the show. We look forward to a substantive and informative day for industry, media and government to view and discuss the latest innovations in the automotive sector, including the cutting-edge displays in our "Advanced Technology SuperHighway." A full day of news-making events featuring keynote speaker Mark Reuss, North American President of General Motors. The day offers a private preview of The Washington Auto Show to government, industry and media officials and culminates in an evening Sneak Peek Reception highlighted by a special tribute to legendary automotive designer Carroll Shelby. Washington Auto Show will start at 8AM with a breakfast, sponsored by Mazda. 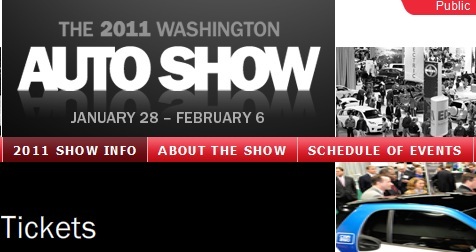 For more information, please visit The Washington Auto Show at www.washingtonautoshow.com or call the show office at 202-249-5060.